Just any FYI looks like at 90% with a running car. I needed to start drving it now and see what else could be wrong with it etc. but at this time it runs. Stll need to drive it but running is always good. Why is it the last part you replace all ways the bad part???? One week away. Looks like about 35 people at this years run. Excellent numbers. We will be there with the gray Baja and maybe the rail if I can finish it this week. Anyone from the east side like to start the slow ride out next sat at 8am or so? I"m towing the trailer and will stay on the normal streets. No freeway if I do not have to. 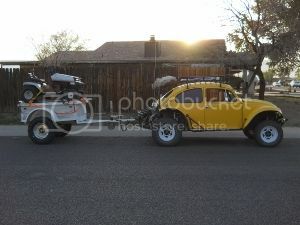 Baja, trailer and highspeeds not that fun. Just heard back from Lemorris at Chirco. Joe has agreed to throw $200 our way for parts or accessories. So I now have two $100 gift certificates to give away this weekend. i agree dalton! the wet sand will make the ride a little rougher in the cross-terrain but less of us will be getting stuck! Not sure yet as my engine is still in pieces. Cliff Campos at Unique Metal Products (UMP) stepped up with a 4 qt. oil container. BTW - I'm bringing a dutch oven so I can heat up chili for lunch, if anyone wants to have some. Bringing bowls and spoons too, and it can be for the Dogs and Burgers. Loading the truck. Lots of stuff. See ya guys in the morning.